For the last number of years, seeding has been a sprint to the finish. Difficult weather conditions, with constant rain in the forecast, pushed us to hammer the crop in as quickly as possible. This year has been a a very different – and welcome – experience. However, it has not been without its challenges, with cool May nights and rains causing real concerns. 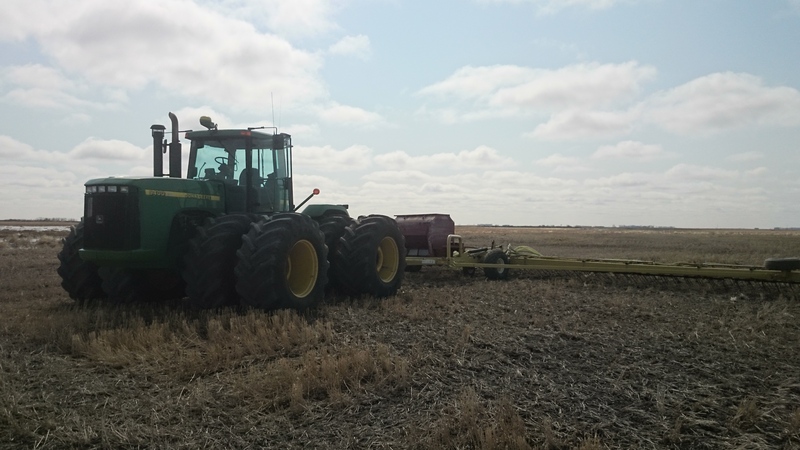 We completed #plant15 on Saturday, May 23. It’s hard to believe it took that many weeks, considering the relatively relaxed atmosphere that it was, being that we actually started on April 23rd. We had a few breaks, including a 5-day rest before the final run. It rained last weekend, shutting us down just as we completed the flax. 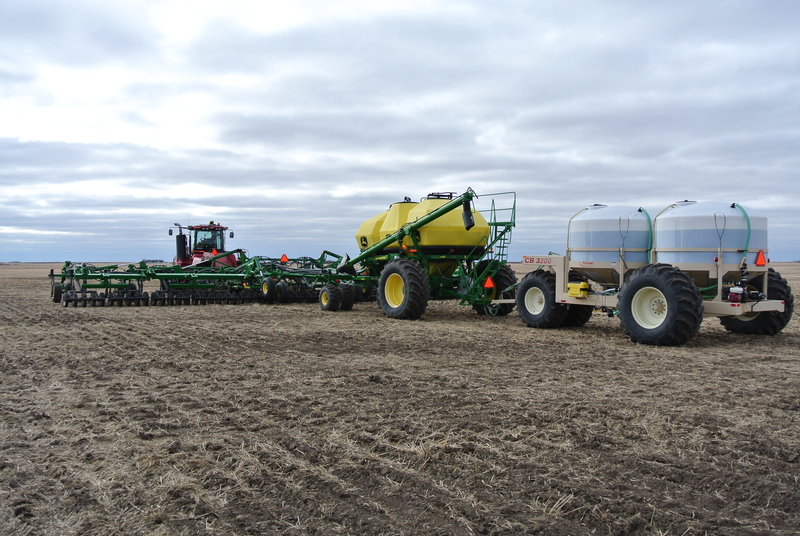 We started again on Wednesday with the soybeans and one last field of canola. I think one of the best ways to tell you about seeding is to show it to you. So, what follows is a collection of photos from the seeding season. Preparing to start seeding is always stressful. Getting ready to go seeding is, as a previous blog stated, hell. 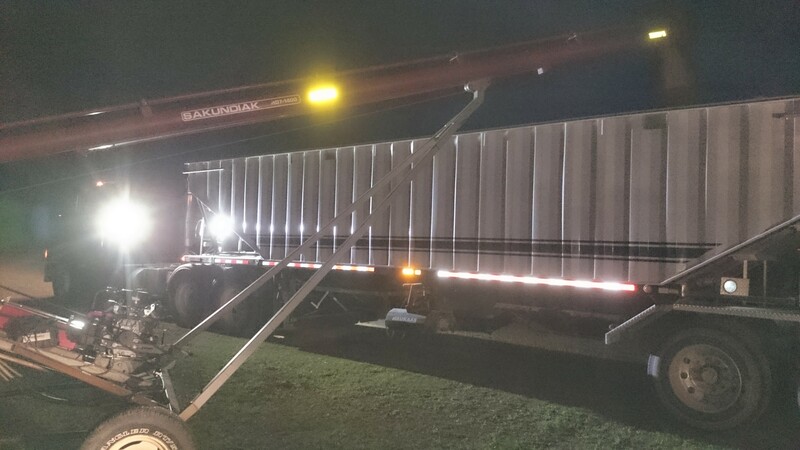 There are endless jobs to do: cleaning, treating and organizing seed; checking and loading drills and air carts; finding and fixing the numerous problems that pop up every spring; hauling and marketing grain; and the non-stop job of managing cash flow. All of these things are all in preparation for the most important job of the year: seeding. Dad rather accurately refers to this time as “Hell Week”. 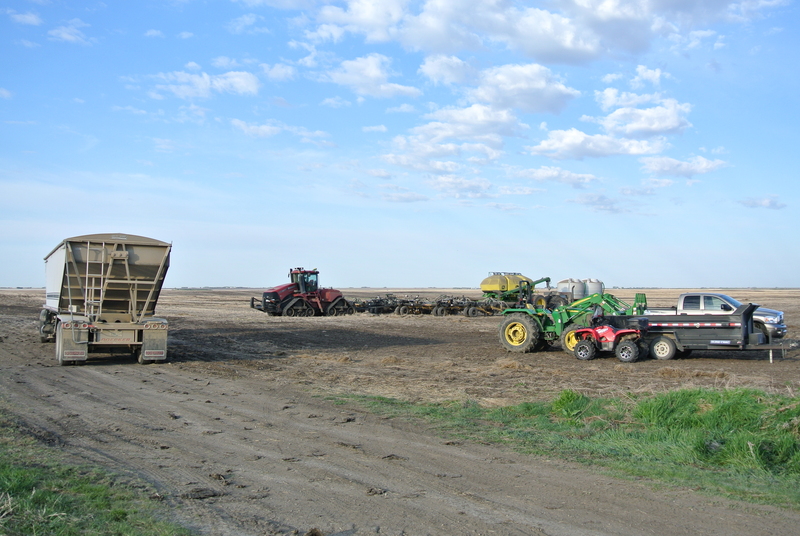 The first couple of days of seeding tend to be slow – it takes awhile to get in the swing of things. We usually start seeding with peas. A large-seeded crop that does well in cool soils, peas are a flexible crop that work well early, especially since they are a shorter-season crop that can be combined early as well. We have two drills: one is an old-style hoe drill, as shown above, with a fixed frame that each shank is directly attached to. Since the shanks are not independent of each other, depth control is pretty poor. The frame of the drill cannot follow the contours of the ground very well, so all shanks are essentially controlled as one. Our other drill, a SeedMaster, has independent depth control; meaning, each shank is hydraulically pressured against the ground to consistently follow the contours of the soil. For small seeded crops like canola and, to some degree, cereal crops like wheat and barley, this is a vital tool to ensure proper depth of each seed. For large seeded crops like peas and lentils, this is rather unnecessary, and we find the hoe drill works just fine. The advantage of the hoe drill is simplicity. They are cheap, easy to fix and handle all kinds of tough field conditions – but they do have their limitations. That is why we usually have our drills split up throughout seeding. Once the drills get moving, burn-off begins. Spraying is an intense, fast-paced operation. Once seeding really gets going, it is time to get the sprayer out and get some “burn-off” done. Burn-off, or pre-seed spraying, is a very important operation to do precisely. The wrong chemical on the wrong field could spell disaster, and it is important to try and stay a couple days ahead of the drills. Since we can seed upwards of 700-800 acres per day, that makes for some very long days in the sprayer. These machines are marvels of technology, with automatic boom height control, prescription-applied products, touchscreen controls and a variety of performance-enhancing features to make you more productive every day. They do, however, come with a steep sticker price! It is critical to ensure burn-off is done properly. The best defense against weeds is to simply not have them at all; a well-timed burn-off with the right products at the right rate can mean the difference between a clean field and a dirty one, which can make all the difference in your farm’s ability to produce a profit. Chemistry is a surprisingly important aspect of farming today. 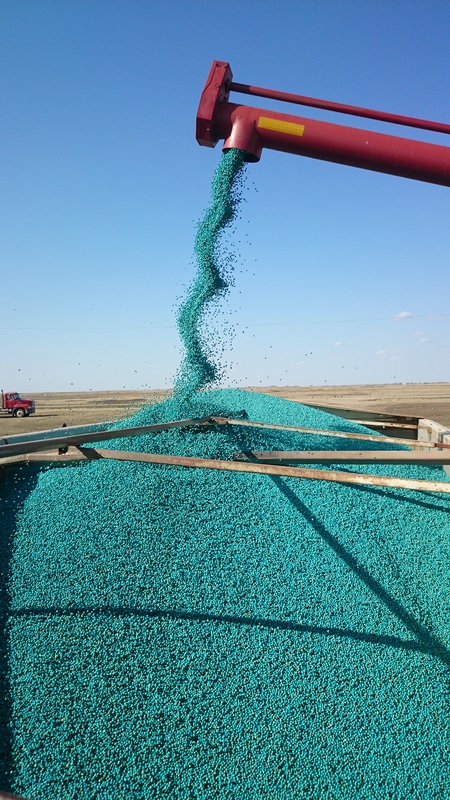 Treating seed is a tricky but vital component of seeding. One aspect of farming that has seen significant change in the past few years is treating seed. Only a few short years ago, most of Dad’s crop went in the ground without seed treatment. That was due to a few factors: treating equipment was poor, the products were pretty weak, and there was a general belief among farmers that it was a waste of money. Today, seed treatment products are a vast improvement over their predecessors, with some of the best chemistries in agriculture going into them. Treating equipment is much more accessible, affordable, and accurate. With the massive investments that go into the ground during seeding, adding a treatment to protect the seeds is just good management. Although getting good coverage and proper application rates is still difficult, the end result of a protected seed is well worth it. 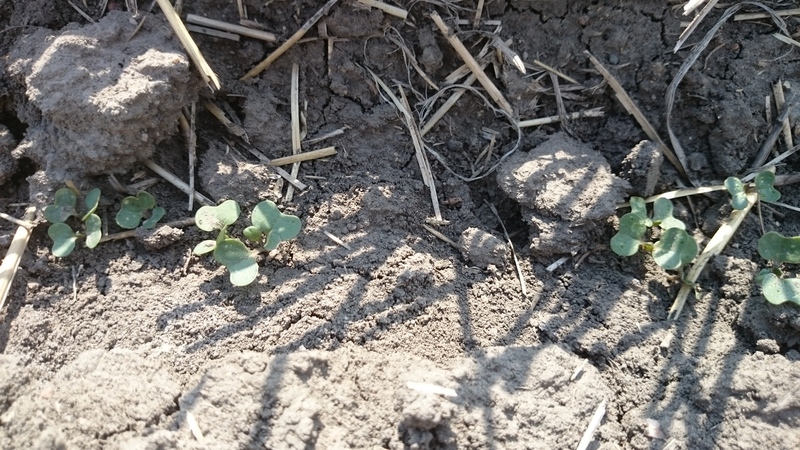 These little canola seedlings may have a long way to go – but every journey has a first step. Seeing the first little seedlings push their way out of the ground is a wonderful feeling. It is at that moment that you know you’ve got a crop, that all your planning and hard work is finally starting to show for something. But, the reality is that there is a lot that can go wrong yet, and one disadvantage of our early start to seeding this year is the threat of frost. You see, it is quite common for us to get freezing nighttime temperatures well into May. Canola is very susceptible to freezes, as its growing point is exposed as soon as it cracks the ground. This canola crop emerged in early May. Last weekend a system moved in, referred to as a “Colorado Low”, that clashed with a very warm weather system we had been experiencing. These two weather systems reacted violently together, with substantial rainfall and even snow falling east of here. We got some rain out of it, which was rather unwelcome; but the more concerning part was the cold nights to follow. As the skies cleared Monday evening, the temperature quickly dropped below freezing. In fact, for ten hours that night the temperature was below the freezing mark, and maxed out at -5.1 degrees Celsius. That is a very cold night for our little seedlings, and I was sure our early canola would be lost. Amazingly, all of it survived it just fine! I’m counting my blessings on that one; we don’t usually get that lucky. 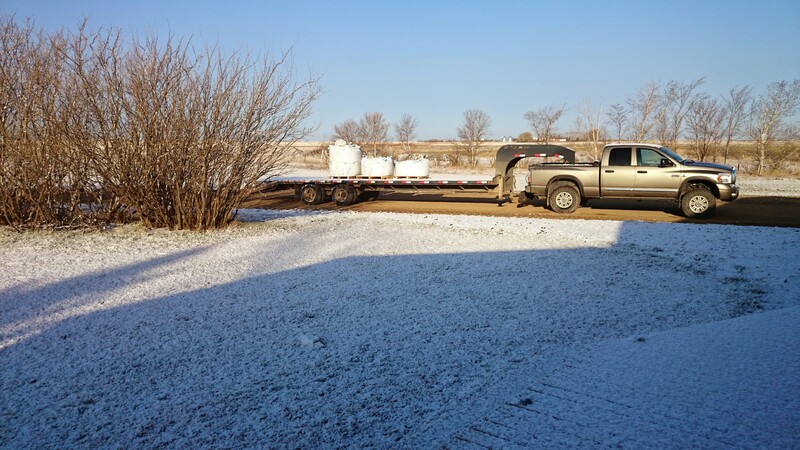 As seeding wears on, the days tend to get longer and longer. It is about the halfway point of seeding that you really begin to feel it. The late nights, the early mornings, the constant planning and math that you have to do. The drive for perfection, or as close to it as you can get, pushes you to do everything as perfectly as you possibly can. But, as seeding drags on, it can be hard to keep the intensity up. That is precisely why a good rain delay is incredibly important. 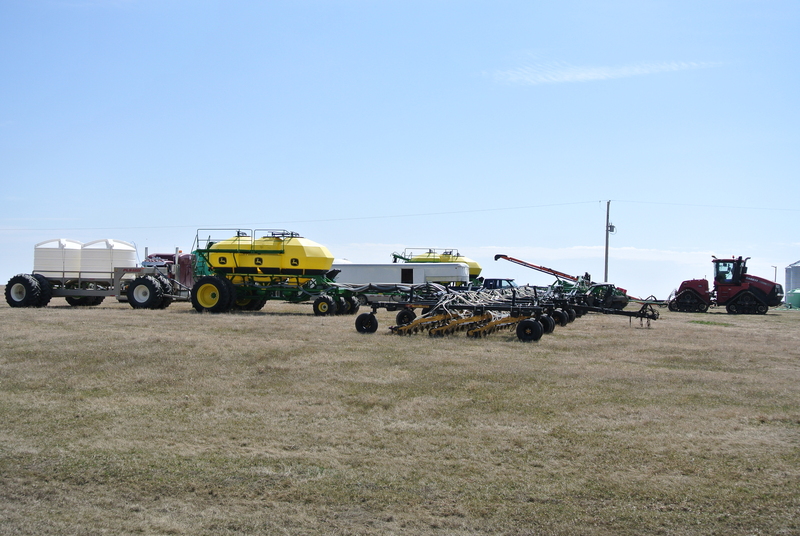 Managing the logistics of seeding is not easy – you have to do everything you can to keep those drills moving. Loading is not all that dissimilar to a NASCAR pit stop. Seeding isn’t all about tractors, drills and sprayers. Some of the most important jobs are keeping those machines moving. Our liquid fertilizer truck never stops moving all the way through seeding. 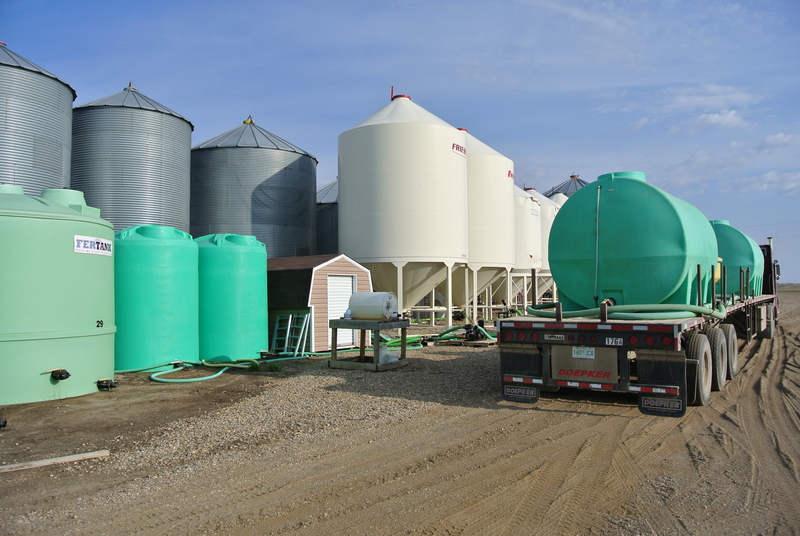 Those two drills, on a typical canola or wheat field, burn through approximately 9,000-11,000 litres (2,400-2,900 US gallons) of liquid fertilizer per hour. Moreover, they are using up tonnes upon tonnes of seed, dry fertilizer and diesel fuel. The sprayer, tearing along at 175 acres per hour, uses thousands of litres of water each hour, and is often too far from home to drive back to load each time. Keeping up with all these demanding machines takes an incredible amount of planning and logistics. And, with all the wet weather we’ve been having, driving highway semi trucks up and down some of our back roads is no easy task. Each field requires a lot of logistics to complete efficiently – even the final one. The last field is always a fun one to start. The end is so close you can taste it, and you start to think about all the other jobs to start on when you’re done. But, that final field can often be a total nightmare. This particular field has been extremely wet for the past few years, and, just like in 2014 and 2012, it was our final field this year. Last year, it took 4 days to seed this 500 acre section; we can normally seed that in one day with just one of our drills. In 2012, both drills hammered away at this field for days, with numerous stucks and difficulties making it an infuriating experience. 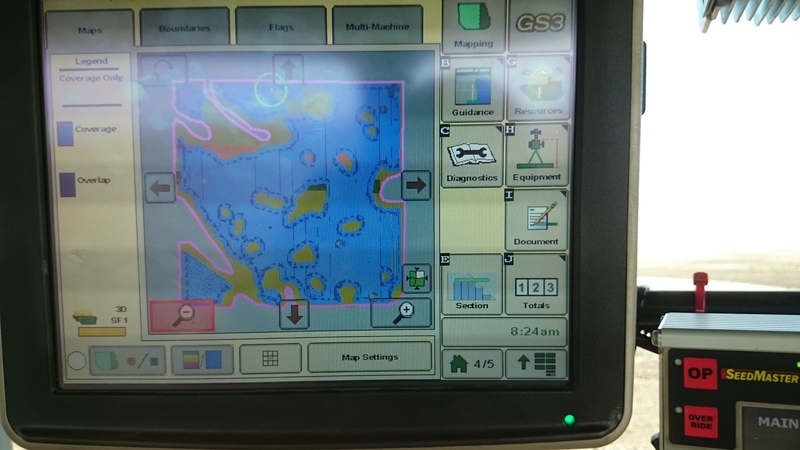 With eyes wide open as to how difficult this field can be, we headed down there with our SeedMaster. As the other drill finished up the soybeans, we switched back to canola to get through this horribly cut-up field. Amazingly, we actually plowed through it with very few issues, and in a day and a half, it was completed. The finished map for the field was a bit of a mess (see insert at right), but that was kind of expected. It has been quite a few years since we seeded through many of the low spots down there. Even though seeding is now “completed” there is still some seeding left to do, with previously inaccessible low spots now dry enough to seed. 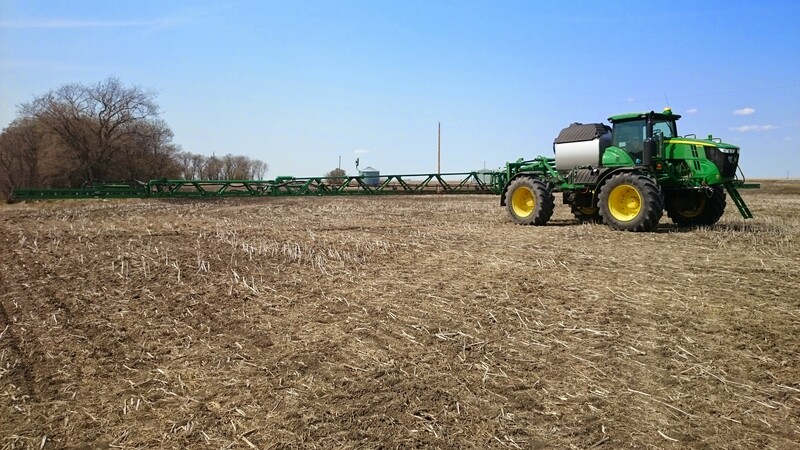 And, although seeding is definitely one of the busiest times of the year, there is a lot to do as we move into June, with in-crop weed spraying starting up very soon, drills to clean up and put away, grain to move and fields to scout to ensure no pests take away our hard-earned crop. Beyond that, initial preparations must begin for harvest, which will be early this year. For now though, we will celebrate another crop in the ground and another successful planting season. Summer in Saskatchewan is a beautiful time, and we have to find time to enjoy it. After all, while we all love farming, we do need a break from it from time to time; and what better way to do that than a weekend at one of Saskatchewan’s fantastic lakes? Well, things have changed greatly since my last blog post. Things looked rather dire then, as a fresh layer of snow had just covered the ground, and seeding looked as though it would never come. Fears of a repeat of 2011’s disasterous crop tore through my mind like an earthquake splitting asphalt. But, the snow melted, and hope rekindled as the weather took a turn for the better. Bright, summer-like days have graced us for the past week now, and the snow is all but gone. The soil has shown itself after an 8-month slumber. Grass grows green (kind of) again, and weeds are poking their fledgling shoots out of the still-cold soil. Yes, spring has arrived, and none too soon, for despite the excitement of seeing spring begin again, it is the eighth of May. Seeding is quite delayed, and this will be one of the latest starts in my lifetime. You may think my last post was a severe overreaction to an event hardly unimaginable, given the year so far. You may be laughing at my rashness, to go so far to excitement for seeding to begin, to the next day believing all was lost, and coming full circle today believing again that seeding will start soon. It does sound awfully foolish, even I will admit that. This, however, is the very nature of farming. The weather chooses to do what it does, and sometimes this can be extraordinarily frustrating, painful and depressing. Sudden joy can erupt from even the smallest of rain showers in the early days of June, giving the seeds the moisture they need to germinate. Conversely, a July storm can quickly turn from wonder and astonishment of the power of nature, to a devastating, horrified feeling as you watch hailstones shred the crop of your dreams. Farming is full of ups and downs, and can be a rollercoaster of emotion. Such has this spring been, and for this reason I have swung from optimism to pessimism more times than I can count. It is for this reason that I started this blog. It is an outlet for me, a place for me to pour out my emotions and lay them bare. Nature can be a cruel mistress, taking dreams and hammering them mercilessly to the ground. These are the lessons we learn, and the longer we farm, the better we learn them. Fortunately, my fears last week were proven wrong, and we plan to begin seeding as early as Monday (we hope). Our air drills are pulled into the yard, and we have one of them pulled apart to get it ready. It is entering its sixth season, and has seeded nearly 40,000 acres in its lifetime. Not surprisingly, it needs some maintenance. 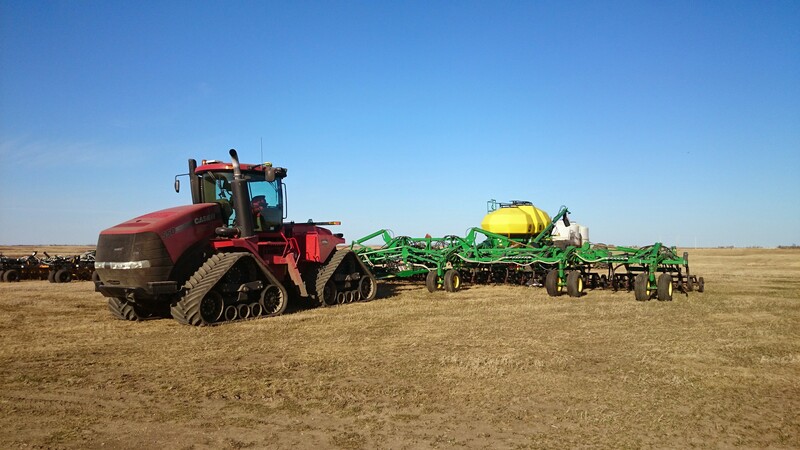 Our other drill is newer, a 2010 model, and being that 2011 was not really a year where many acres are seeded, it is still relatively new, and needs little work. You see, an air drill is a toolbar that steel soil openers are mounted to. These open up the soil, close it, then a packer wheel seals the soil closed again. As the opener runs through the soil, it drops metered seeds and fertilizer into the row. While there are dozens of variations to this design, this is the basic premise of all air drills. They are called air drills because the seeds and fertilizer are forced through the opener by a large fan mounted on the tank following, which holds the seed and fertilizer. Search “air drill” in Google and you will see what I am talking about. Yes, we are moving to the most exciting, adrenaline-fueled part of the year, where we will drop hundreds of thousands of dollars into the soil and pray that Mother Nature rewards us. I will try to keep you updated as this intense season continues. Talk to you soon.